Discussion in 'Studio & Stage' started by LSchefman, Feb 17, 2016. Audie and The Fight like this. So I'm getting both my Splawn quickrods retubed next Friday, so I'm kinda "quickrodless" at the moment. But I have my Friedman to play with at the moment, I've been playing it for the last week. I really like this amp alot, very vintage ACDC sounding in the c45 mode/ be100. But no doubt it can get very hairy in the fat mode/ hbe100. But I miss my quickrod already and can't wait to play it again with new tubes. My plexi is getting the Ruby bstr and the snake skin =c= or mby the eh El34s. Either way,it's gonna sound good! Made a video for you guys with the Friedman, it definitely has its strengths as an amplifier. I'm using my 96 PRS cu24 w/59/09 pickups, first split in the neck then full on bride pickup. That sounds great. Friedman are one of the few Marshall style amps that I can play through and like. 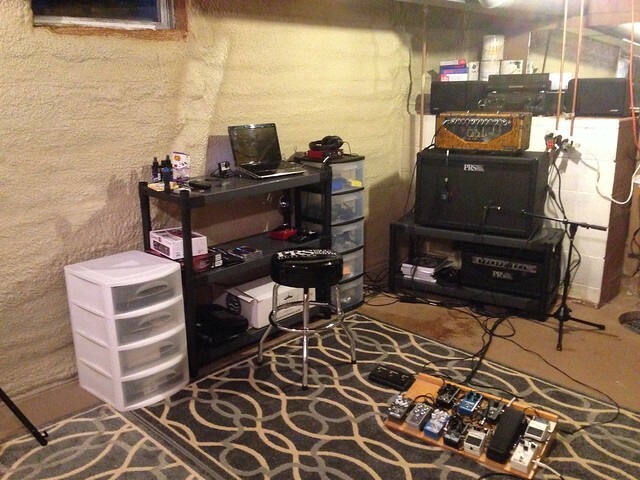 Recently cleaned up my basement studio, got everything not related to music OUT (greatly increasing the amount of space) and laid some rugs down, added another guitar hanger... oh, and the Custom 50 has been a nice bonus as well! 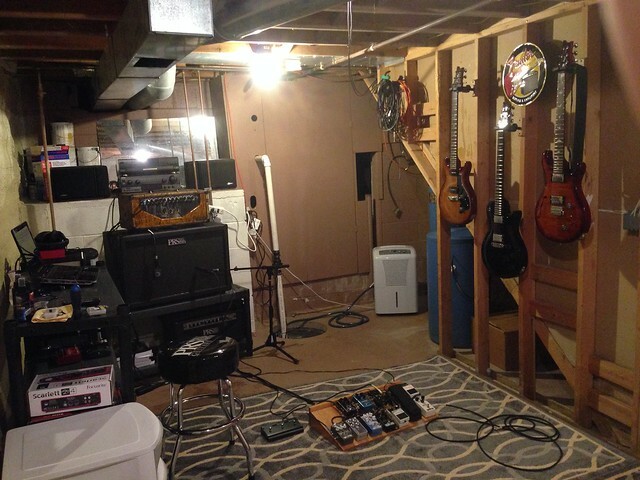 LOVING the space to work on new music! Finally doesn't feel like a basement. 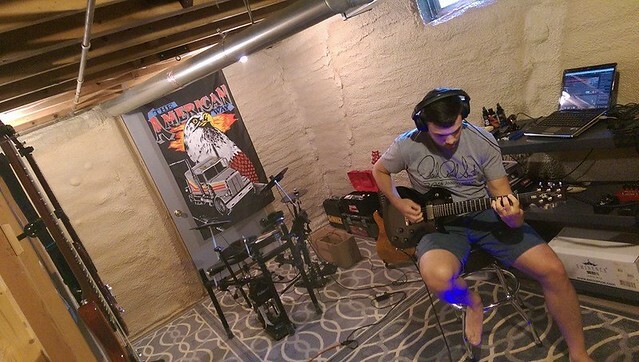 Above, my drummer and I working on a tune... not really a new one, we've been back and forth this one for a while, but I think it's finally ready for polishing. Guitar part is just a quick scratch track of my 57/08 loaded SE Akesson, into a Wamper Sovereign, to the Custom 50, mic'd with an SM57. Ridiculous flag courtesy of a friend of mine... inside joke. Like that a lot! Does your drummer always play the electric kit? He sounds good on it. Mix between the drum and guitar tones sounds great. Les, I really like the electronic tracks you've put up recently. I really like Argo II a lot. Bounce is great too. Soundcloud went goofy on me and kept pausing the tracks saying something like another device was attempting to play the track. Damn technology glitches. At any rate, fine job sir! Just picked up this baby! The Gallien and Krueger 250ml, running it in stereo. 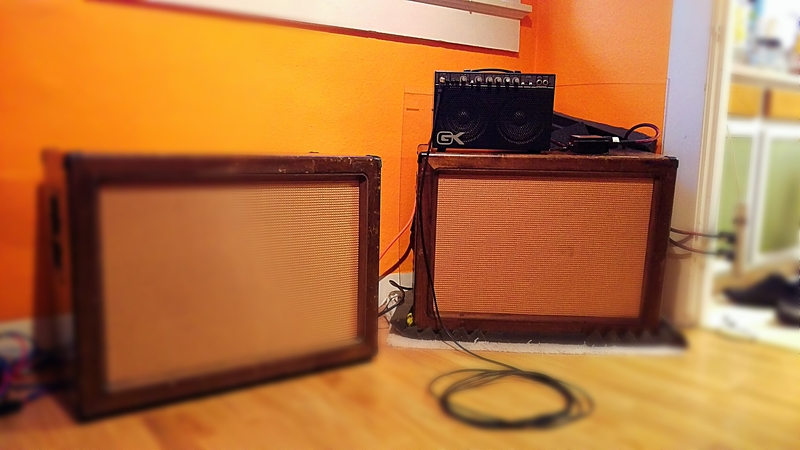 Using a Neunaber wet stereo reverb through two 2x12 Emperor cabs loaded with vintage Ev12Ls. Playing with my beloved all maple neck 88 ce, loaded with 59/09 bridge and 57/08 neck. In the video I'm using the neck split coil. This cell phone video does no justice, the amp sounds huge! Song and The Fight like this. Hey guys thought I drop a little funky riffing. Using my single cut loaded with 57/08 pickups into a Friedman modded Marshall SL100 w/ TC Electronic G System for delay. Sounds crunchy! Also to add I recorded this video to test out my Emperor cab that I stuffed with foam. The speakers are vintage EV12ls. I really like the sound, very tight and focused. But I feel like I'm loosing alot of the bottom end, so I think I'll be going back to my original gig. Also I feel like you have to do experimenting like this at least twice to really get to know what it is that your changing, or at least for your ears to really hear the contrast cheers! Wow. Nostalgia! I spent the 80s with a Gallien Krueger 112LC amp. Best solid state amp you could own at the time. New guitars get me going sometimes 3 recording to assault your ears the "Mira again" clip has some of my best guitar playing in awhile I think, to bad its so in the background. JustRob, bodia and LSchefman like this. Good job Rider. Sounds good. We need to get you a 4 track program for your iPhone so you can remix that first one. Nice playing in there but l tough to hear some of it. Do you still own the PS Mahoney? Here's a clip off an album I recently released where I'm attempting to play my old CE-24. It's not guitar, but I'll share. Late last year I got into modular synthesizers. I had never touched one, or even knew what one was prior. I stumbled into it after considering a nice midi controller keyboard so I could learn some piano. Here's an example track I would record after take a little bit of video. And some guitar related clips. I had just got a Helix Rack and Variax equipped guitar. At least the shirt is proper! Tosca, bodia, jxe and 1 other person like this. Dood! That shirt is killin' it!